So I’ve been reading a lot lately about authors versus reviewers and how they want book reviews especially on blogs to go down. I for one don’t give a lot of one star reviews even on Amazon. Five-star? I may if I love it! Love it! Love it! I guess I always go with what I was taught growing up if you don’t have anything nice to say keep your mouth shut. I will however if a book was very much not what I expected or not what I took from the blurb or it was impossibly hard to read or if I truly found it offensive. I actually find it harder to write the reviews about books I considered just average. 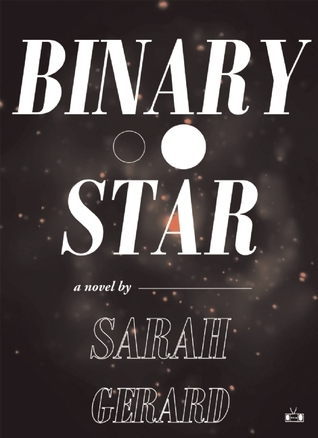 This all comes around to Binary Star which was a beautifully written quick read that I first heard about on a blog that I can’t even remember. I should probably have researched it a little better because yeah, NOT MY CUP OF TEA. The book is told from the rambling point of view of a serious anorexic about her and her drunk boyfriend. And it was so depressing. There was no sense of hope. There was no sense of help. The two main characters didn’t seem to even like each other that much. They take a road trip and bump up against each other on the path to destroying their lives. On the plus side though it was beautifully written and it was way outside the scope of what I would normally read. I’m just glad I finished before I couldn’t take anymore. I thought about whether or not you’d want to give this to someone with those kind of disorders (or someone you think may have anorexia) and I don’t know about that. I’d probably be very careful though. I really couldn’t think of anything to do to make yourself barf that wasn’t in this book. The character is rather proud of the way she can make herself disappear. And the two characters are pretty militant vegans (or they want to be anyway- I think you have to eat to even be considered a vegan) so there’s mentions of how the animals are slaughters and such and also a dead dog. Like I said this book was so not my usual read. I’m calling it branching out though and will really have to think about these things before I just go off and Kindle purchase them. Recommend: Read it for the lovely writing or at the very least know what you’re getting into when you do crack the cover.